5 people have bought this item! High Water & Rain Resistance. Water Based Product/Water Clean Up. Everbuild 405 Path & Patio Seal - Clear - 25l - Bo . . .
Everbuild 406 Stabilising Solution - - - 5l - Box . . .
Everbuild Natural Stone Sealer - Clear - 1ltr - Bo . 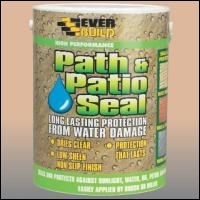 . .
Everbuild 405 Path & Patio Seal - Clear - 5l - Box . . .
Everbuild 408 Exterior Wall Seal - Clear - 5l - Bo . . .